The Lunar Eclipse is occurring in the Sign Leo at zero degrees Leo. Of course the Full Moon in Leo opposes the Sun in Aquarius. The Sun is joined with Mercury and Pluto in Capricorn, along with Saturn in Capricorn. 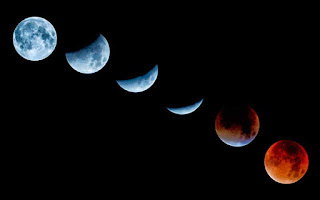 Planet Uranus is making a challenging connection to the Lunar Eclipse at 28 degrees of Aries. Uranus can bring sudden upsets or surprises, and sometimes they are life changing. This Eclipse could bring significant changes for many people. Since eclipses start before the actual day and continue for months after the eclipse date, we can look to humanity and the government shutdown as the big upset that is life changing for hundreds of thousands of people. Leo (where the moon is) rules the individual while Aquarius (where the Sun is) rules humanity. Capricorn, where Mercury, Pluto and Saturn are currently sitting, rules the government. One more tip: Uranus belongs to the sign of Aquarius. Therefore this eclipse is associated with disruption for the people and the cause is the government. If you are not a government employee affected by the shutdown, count your blessings. Think about how long this shut down will impact the employees. You and I both know that once you get behind it’s really hard to catch up. Even if you get a big check down the line, it’s already committed. It’s not a good solution for our country and it is affecting the economy across the board. And that brings us to where the eclipse is actually occurring: Leo, the individual and Aquarius, humanity. How do we balance our individuality with other people? This is a good time to ask yourself: what are my talents and gifts that I can share with other people to make a better place here on Earth? How can I share from my heart and soul without getting totally carried away by my ego and my desire to out-do everyone else? How can I balance my desire to share and receive attention and abundance in a way that is in accordance with the good for all? Right now, in our government, there is an abundance of individual ego battling the suffering of humanity. Maybe this energy will help us envision what we want for ourselves in a way that also envisions goodness for others AND the elimination of unnecessary suffering. We will always have suffering, illness, and loss. That is part of life. But some suffering, like the government shutdown causing trauma and distress for so many . . . is that necessary suffering? Of course we need to look at our own consciousness. Any government is a reflection of the people. Who are we and what can we do as individuals to make it different? Things to think about as we gaze at that beautiful eclipse!